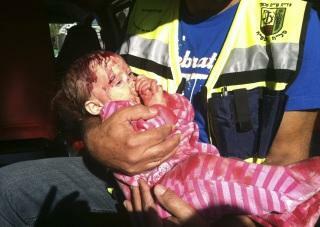 An injured Israeli child from Kiryat Malachi, where three Jews were killed by a Hamas rocket. This is a poetic translation which fails to convey the true meaning and purpose of Israel’s military operation. The original Hebrew is, עמוד ענן, “Amud Anan,” a phrase taken directly from the Torah.